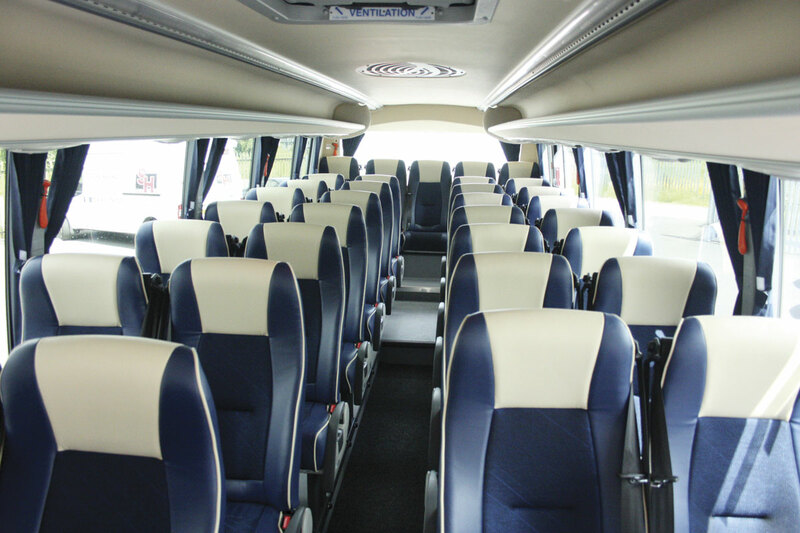 Since taking over the UK franchise to sell the luxury minicoaches produced by Spanish builder Ferqui, Steve Peach of Connaught PSV has re-established the brand as one of the most popular in 16-36 seat sector. Ferqui had previously been marketed by Optare and in recent years the best known products have been the Mercedes-Benz Sprinter based Soroco and the Vario based Toro. Steve took over the franchise following the decision by Optare to pull out of that market sector but he had in fact been selling them successfully for many years as a dealer for Optare. The announcement of the impending demise of the Vario in 2014 was a major problem for Steve, as it was for all the other manufacturers and dealers for whom the Vario was a key base model. Connaught was one of the quickest off the mark with a replacement, which was not altogether surprising, because Ferqui specialises in the small coach sector and there was already considerable expertise of building on alternative chassis. One only has to think back to the various variants of the Optare Solera. Ferqui’s chosen route was to utilise the 1224L Mercedes-Benz Atego forward engined chassis. It is interesting to note that Ferqui have chosen to go for the 12 tonne GVW version of the Atego, whereas some other builders have chosen to go for the 10 tonne or even nine tonne version. According to Steve Peach, Ferqui already had embryo designs on the drawing board designed around the 12 tonne Atego chassis and they could see no reason to change. They felt that the freedom from weight issues that the 12 tonne chassis gave them was a bonus, especially after the years of achieving the weight critical 8.5 tonnes on the Vario. The Ferqui F5 will never have those problems. With commendable speed Ferqui had the prototype F5 ready for Connaught to display at last autumn’s Euro Bus Expo where it attracted a great deal of attention. Following that exposure the design has had some minor tweaking and it is now fully into production. 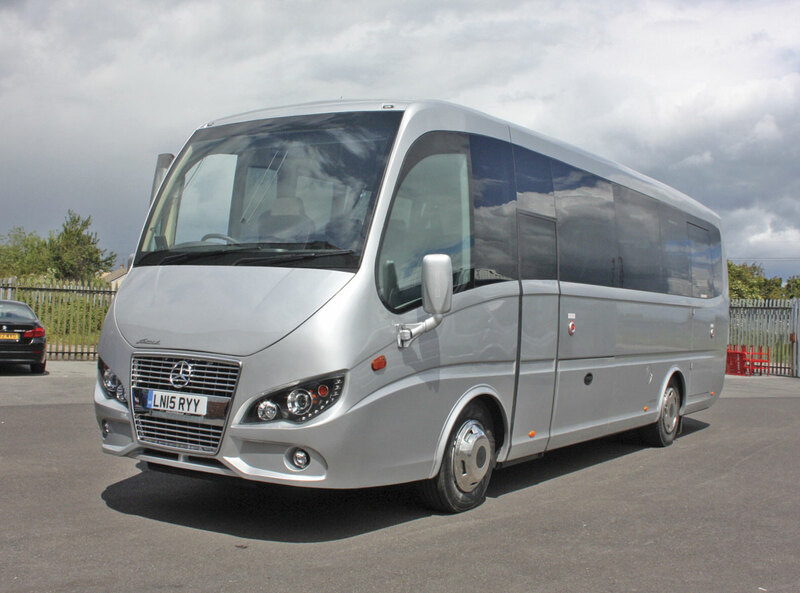 The vehicle I had the pleasure of evaluating was the fifth to be produced and was destined to join Atlas Coaches in London. It is in fact their second because they also bought the prototype at the Show. Steve has opted at this stage to market the F5 in a fairly rigid way with a broad standard specification and a restricted list of options. The base chassis is the Mercedes-Benz Atego 1224L which when bodied by Ferqui produces a vehicle which is 9.57m long, 2.5m wide, 3.2m high and has a wheelbase of 4.76m. The Atego is powered by the Mercedes-Benz 7.7-litre OM936 four-cylinder, direct-injected, turbocharged and intercooled engine to Euro6 emission standard using AdBlue. It develops 238bhp (175kW) and a maximum torque of 1000Nm available across a wide speed range. The engine is matched to the Powershift 3 automated six-speed transmission. The front axle is a beam unit with parabolic leaf springs, telescopic dampers and an anti-roll bar. It is rated at 5.3tonnes (plated at 4.9 tonnes). The rear axle is a hypoid bevel unit rated at 11.0 tonnes (plated at 8.1 tonnes). It is fitted with air suspension using two wide spaced air bellows, telescopic dampers and anti-roll bar. The ratio is 4.3:1. Wheels are 6.75 x 19.5 units fitted with 265/70R 19.5 tyres. Steering is the ZF 8095 Servotronic powered system, braking uses disc brakes all round and there is also an exhaust brake operated from a stalk on the steering wheel. Electrics are 24v using two 12v/165Ah low maintenance batteries housed in a special locker on the offside. 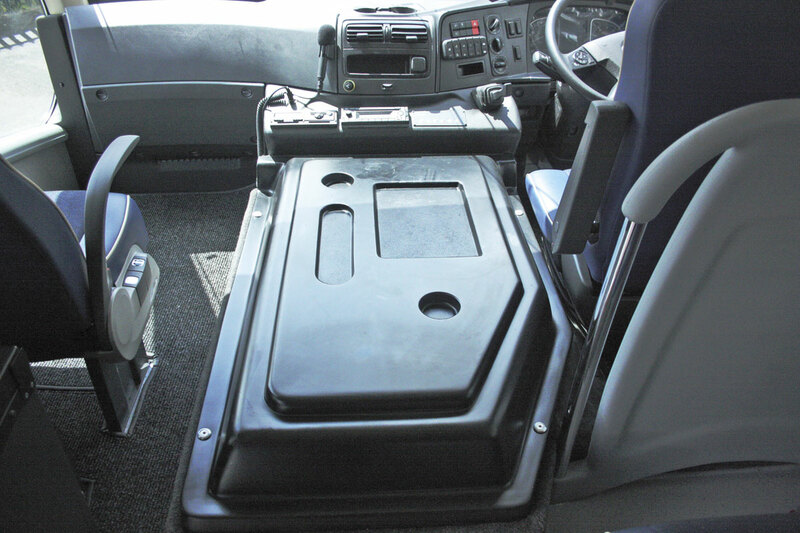 The vehicle has a 120-litre fuel tank mounted on the nearside and a 25-litre AdBlue tank mounted on the offside. The body is framed in heavily corrosion protected galvanized steel tubing packed with acoustic and thermal insulation. It is clad in moulded fibreglass panels. 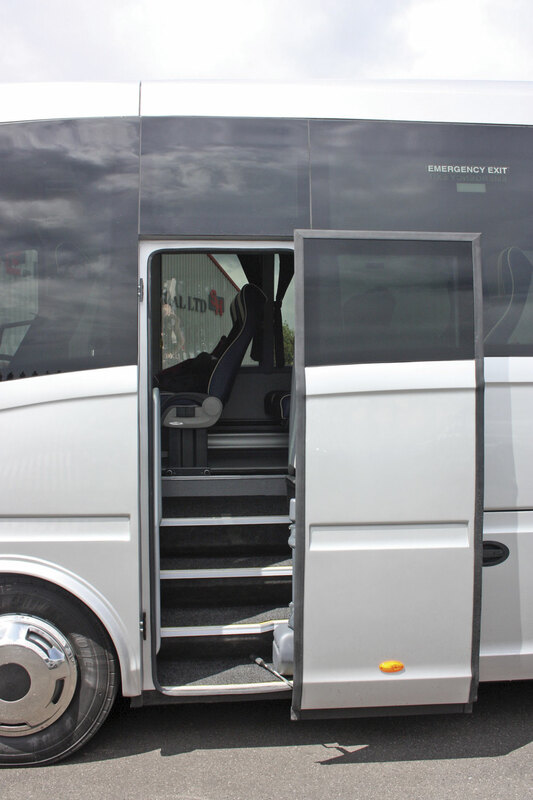 The entrance is aft of the front axle and has a straight four step staircase leading to a flat gangway with the seats set on plinths. At the rear there is a small step up and the rear seats are set on another plinth. The gangway is covered in heavy duty carpet, as is the cab. 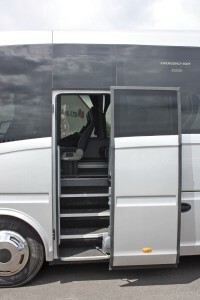 The entrance is fitted with an electrically operated plug door and, unusually, the emergency exit is also fitted on the nearside of the vehicle. It has a wide door and an extra step for easy egress. 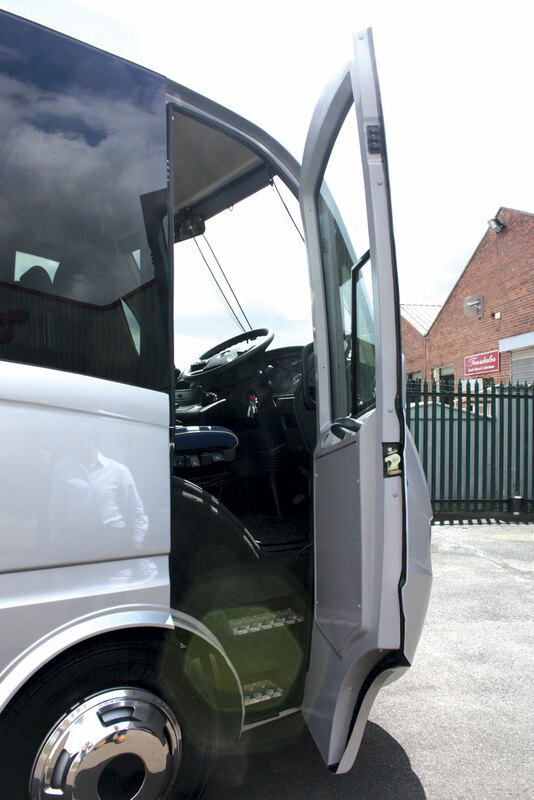 Positioning on the nearside is deliberate because it allows for easy installation of a wheelchair lift if required. Glazing uses large, panoramic, double glazed, dark tinted windows. The rear window is a single glazed, bonded and tinted unit whilst the windscreen is a laminated bonded unit. Side windows are fitted with full draw curtains. The interior is trimmed in soft feel laminated plastic finishers. 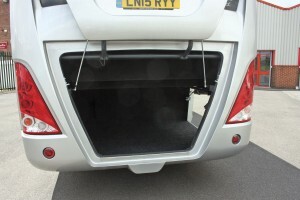 Full length racks are fitted down both sides of the vehicle incorporating individual passenger controls and air conditioning vents. The F5 has convection heating with radiators down both sides of the saloon and is additionally fitted with a roof mounted Hispacold air conditioning unit. Interior lighting uses LED units and there is a night time setting. LED lighting is provided at the entrance. 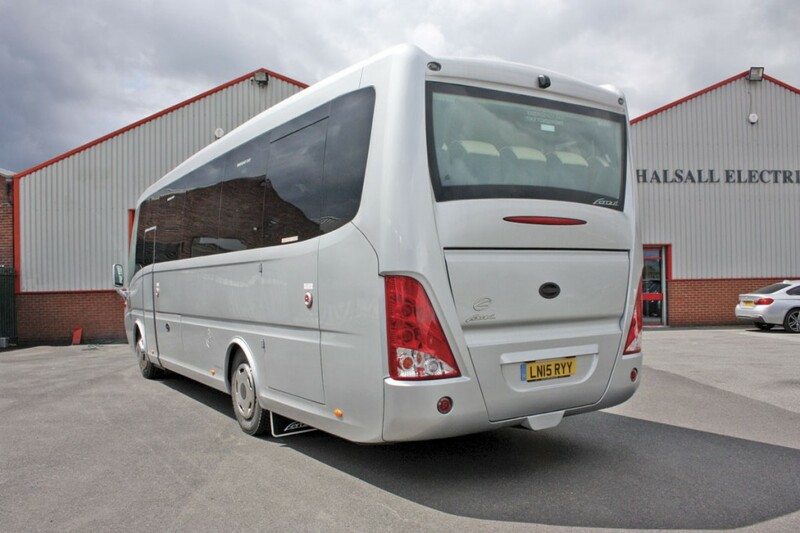 The coach benefits from having a glazed roof hatch which can also be used as an emergency exit. 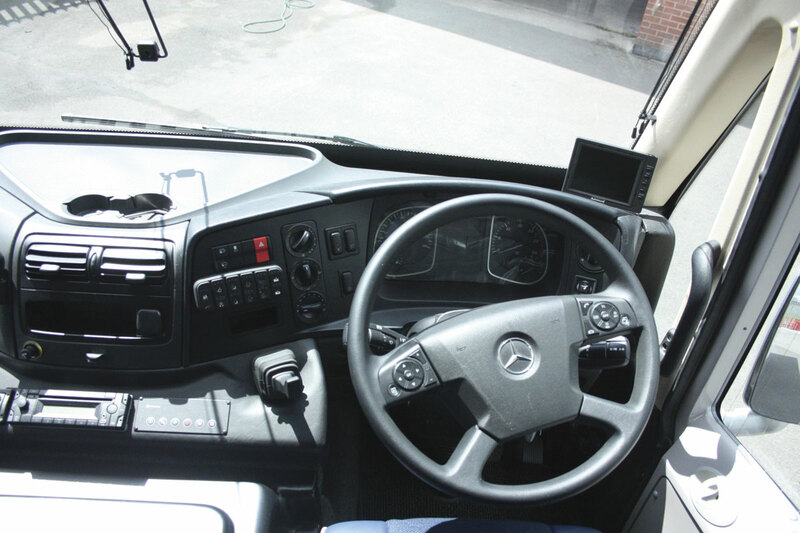 The F5 utilises a Mercedes-Benz sound system distributed throughout the vehicle and there is a hand held microphone which can be used by the driver or a courier. Vogel high backed recliners with grab handles and gangway armrests are installed as standard. All seats are fitted with three-point belts and conform to M3. Seating capacity is between 34 and 36 depending on seat spacing and whether a four or fix seat rear row is specified. 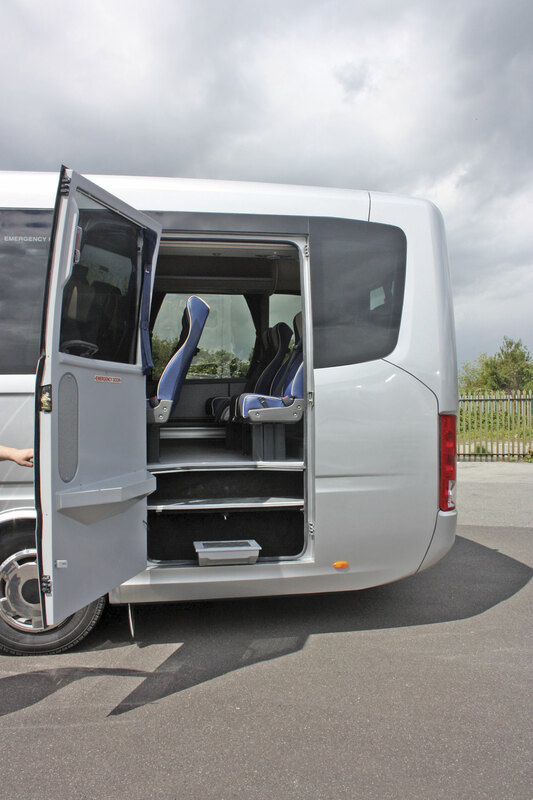 Connaught can achieve 38 seats in the vehicle using a similar specification, but narrower Kiel seat. 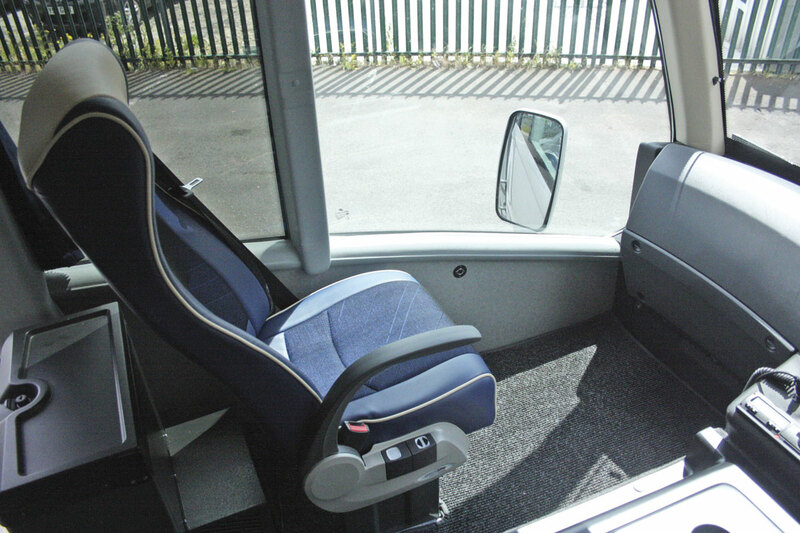 One seat is positioned alongside the driver and is certified as a passenger seat. 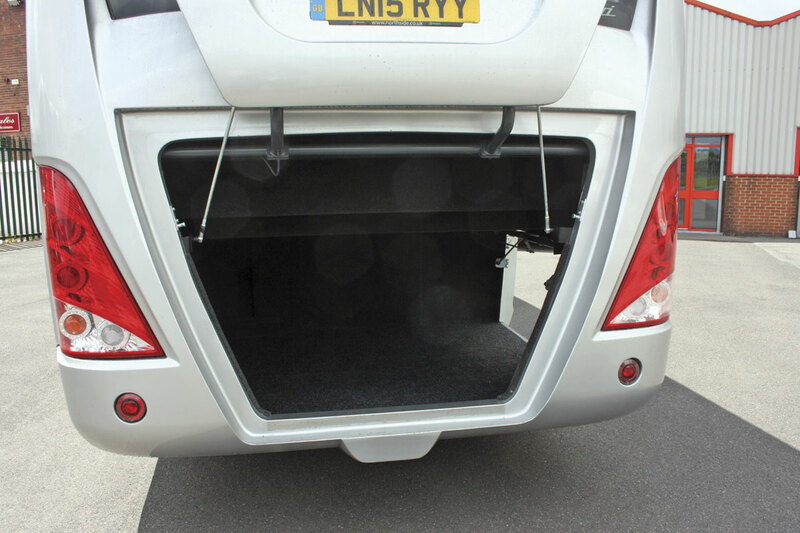 There is a large rear boot accessed by a parallel action lift up door. The boot can accommodate 6.0cu.m of luggage. There is also a useful side locker. The stylish dash incorporates the excellent ergonomic Mercedes-Benz unit with well positioned controls and instrumentation. The steering column is adjustable for steering wheel height and rake. Ferqui re-trim the driver’s seat to match the saloon seating. Fully adjustable and equipped with a three point belt and armrests, the seat can be accessed over the engine cover or by using the separate driver’s door. There is a driver’s locker integrated into the dash and the vehicle has a reversing camera with dash mounted monitor. The vehicle comes with a three year, 250,000km, Mercedes-Benz warranty and the body has a 12 month warranty. 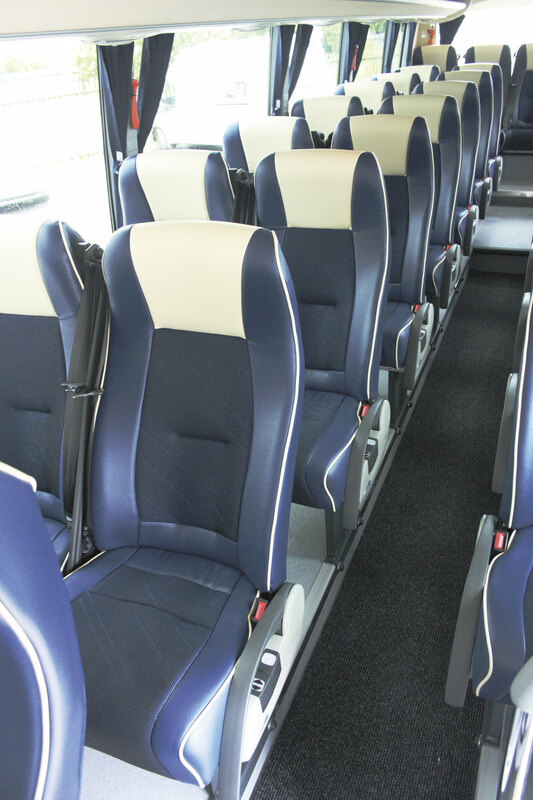 A small list of optional extras are available; typically, a fridge, a hot drinks unit, in-coach entertainment packages, tables and paint – standard is white. In standard specification the vehicle retails at £136,000 plus VAT. The Ferqui F5 is a very stylish small coach and the standard of finish, particularly the glass fibre moulding and the fit and finish are excellent. I accessed the vehicle via the driver’s door. Now there is very little about the Ferqui design that I am not happy with, but this is one item. It is a bit of a climb and frankly others building on this same Atego chassis have tackled it better. Hopefully Ferqui will take another look at it. Don’t get me wrong, it isn’t that difficult, just could be better. The driver’s seat is very comfortable and it was easy to adjust to give a perfect driving position with all controls to hand, even for a short legged person like me. Powering up the Mercedes-Benz you could tell straight away that there was plenty of power available but I congratulate Ferqui for the excellent work they have done on noise insulation because bearing in mind the engine is in effect in the saloon, the noise level was commendably low. Steve and I had no difficulty conversing easily throughout our journey. The vehicle has the Powershift 3 automated gearbox giving two pedal control. This transmission has come on by leaps and bounds in recent years with improvements to the control system programming. The transmission used to suffer dwell and hang on too long in particular gears. Not any more, the current box changes like a full automatic. Take up is instant with no dwell and ratio changes are made quickly, smoothly and quietly both going up or down the box. Kick-down is excellent as well. Handling is outstanding as we’ve all come to expect from the ZF Servotronic power steering, making the vehicle very easy to manoeuvre. Vision through the massive screen is absolutely brilliant. I was a little concerned initially that the inevitable big A posts necessary to achieve the European safety standards on structure, might create blind spots, especially when combined with the adjacent post on which the door is hung, but this did not prove to be the case. The rear view mirrors are very good giving nice, stable, rearward vision all round. We drove the coach out through the village of Thorne, in South Yorkshire where Connaught are based, and headed for the M18 motorway. The vehicle was a real pleasure to drive. Light and easy but with a security in terms of road holding, suspension and steering that was very reassuring. In simple terms it stayed where you wanted it and it went where you wanted it to, when you wanted it to. Braking was equally smooth and positive with no hint of deviation. There is also an exhaust brake available operated by a lever on the steering column. Climbing up onto the M18 allowed me to open the Atego up. As the speed limiter had not yet been calibrated to 100kph, our top speed was restricted to 90kph but at this it cruised happily and it was pulling just 1,700rpm. That would inevitably rise a little moving up to 100kph but not a great deal indicating that the fuel consumption should be good. Steve checked fuel consumption with a customer already operating an F5, who confirmed that he was achieving around 16mpg. That figure is expected to rise as the engine becomes run-in. I would think that on long motorway runs figures around 20mpg should be achievable with careful driving. On the motorway the coach was absolutely rock solid, staying perfectly on line with no hint of wander and no wind noise. Coming off the M18 at Doncaster we found our way through the torturous outskirts with its myriad of roundabouts and traffic lights but the F5 remained docile, completely on top of the job. This area of South Yorkshire doesn’t have many hills but we found a couple of small ones because I was anxious to see if the transmission would start shuttling between gears on hills, which these transmissions have sometimes been guilty of in the past, it didn’t, there was no hint whatsoever. We then tackled some stretches of rural road and here again the F5 was always completely at the top of its game. Precise, smooth and quiet – an absolute pleasure to drive. Riding in the back you appreciated the attention to detail of the design. Very comfortable seating with a generous level of support, superb vision through the large windows and an ambience achieving a nice mix of temperature and fresh air. Ride from the rear air suspension was smooth even over some badly deformed road surfaces, something we all seem to have to put up with these days. The internal noise level was commendably low. I was impressed with the quality of the build, especially the fit and finish of the trim. That all translated into an absence of any shake or shimmer, rattles or squeaks. I was really sorry when we arrived back at Connaught’s Thorne base, I could happily have gone on driving the F5 all day; it really was so very easy. The Ferqui F5 really is a very nice small coach and I have no doubt operators will find it a great asset – totally on top of the job with plenty in reserve. Well specified and well built, it is a vehicle that not only passengers will like but operators will too because it will be a good money earner. 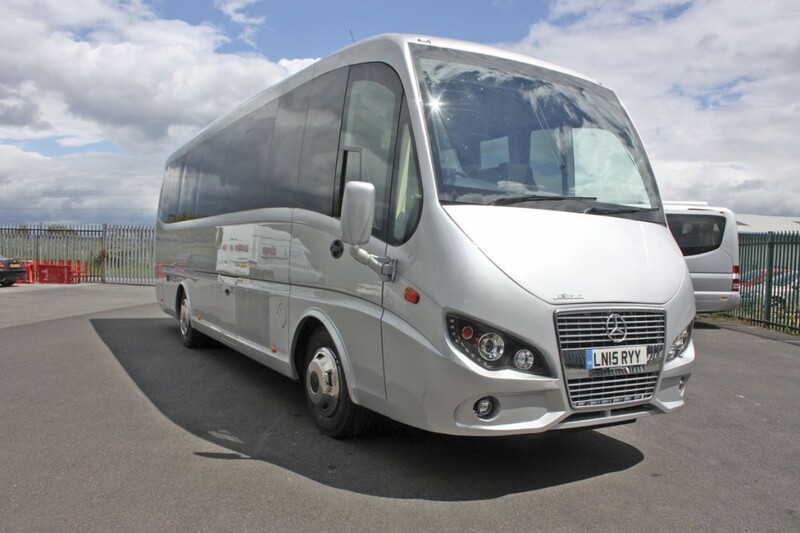 The reliability of vehicles produced these days by Mercedes-Benz is well known and with the quality of the Ferqui body this coach should be capable of working day in day out and hold its residual value. I congratulate both Steve Peach of Connaught and Ferqui for introducing the F5, a real asset to the market.